Summeritis per the Urban Dictionary is a psychological infliction that effects students motivation and ability to concentrate at the end of the school year. This definition should be extended to the larger population who are undergoing a summer malaise. Once the warm weather arrives, we all want to leave our desks and head outside for an adventure. It is a good time of year to enjoy a popular restaurant or theatrical event that you would not ordinarily get into. 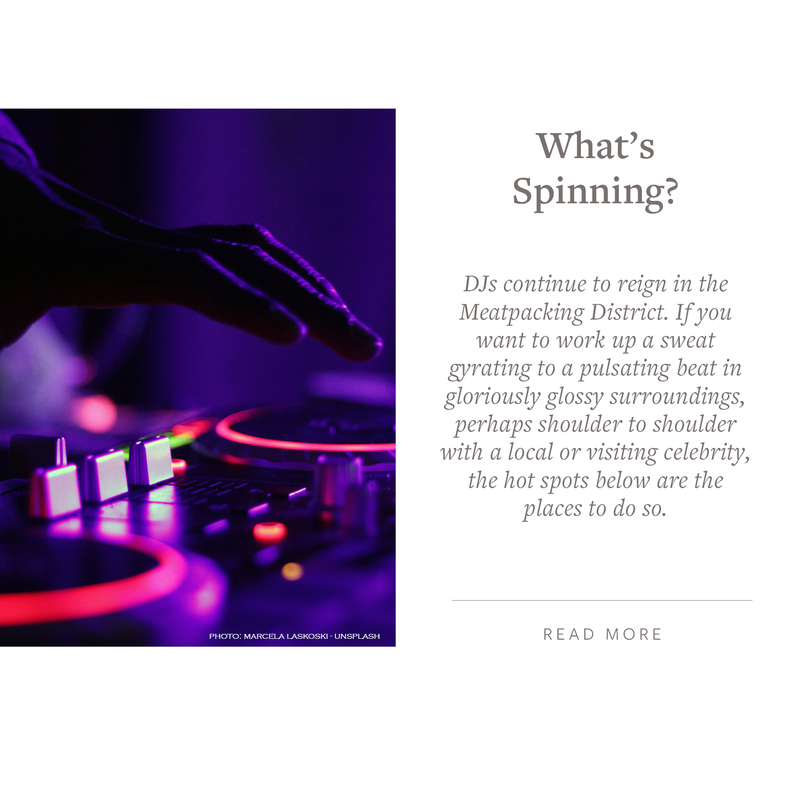 This month’s edition of Culturally Inclined focuses on the Meatpacking District that retains its name from the 19th and 20th century when the cows and cowboys roamed and over 250 meatpackers dotted the area along the Hudson River. The Piers along the Hudson River were where the luxury liners and ships of cattle transported from New Jersey docked. During the 1800’s the Hudson River Railroad created cow tunnels and ran tracks down Tenth and Eleventh Avenue’s causing severe traffic congestion. This western route resulted in many deaths and was referred to as “Death Alley’. 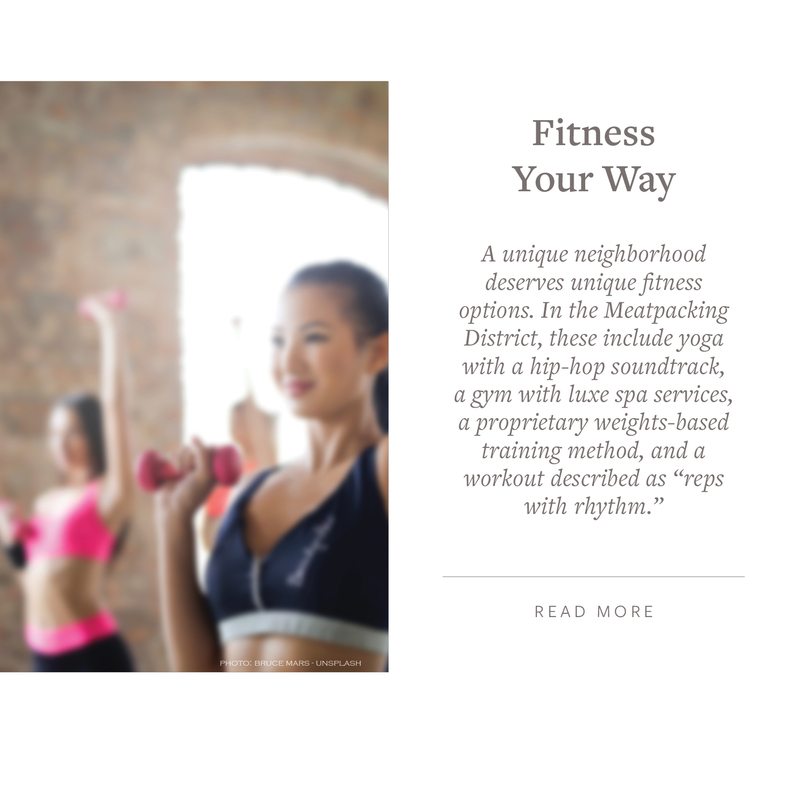 The Meatpacking District on the far westside is anchored to the south by the West Village and to the north by Chelsea within the vicinity of West 14th street south to Gansevoort Street and from the Hudson River east to Hudson Street. 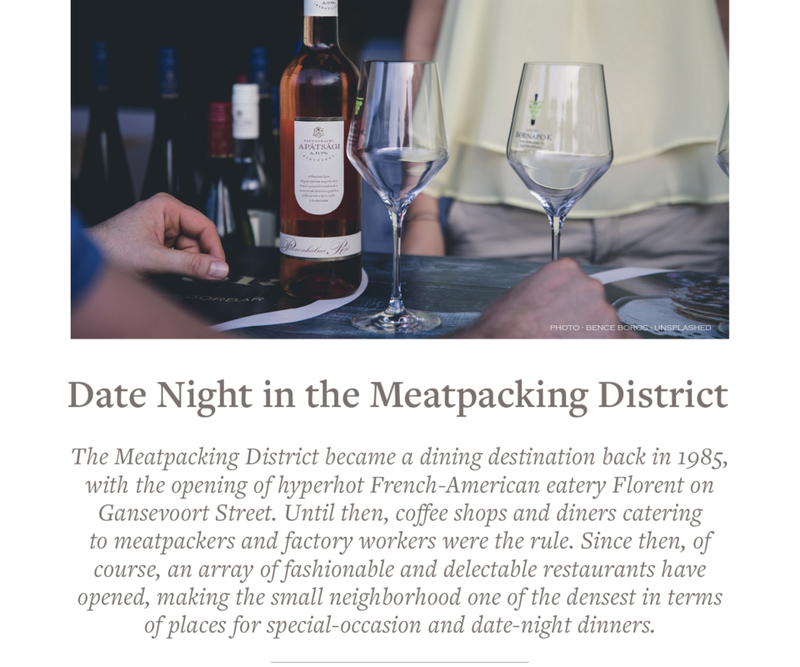 The Meatpacking Business Improvement District extends further north to West 17th Street, east to Eighth Avenue, and south to Horatio Street. Possibly the most famous and recognizable “Flatiron-like” building downtown is the former Herring Lock and Safe Company Building at 669-681 Hudson Street at Ninth Avenue and 14th Street in the Meatpacking District. Built in 1849 and often referred to as “the Little Flatiron Building,” it pre-dates its better-known cousin by more than a half-century. Disappearing into the historical fabric are the industrial origins: factories, slaughterhouses, processing plants, nightclubs, and late night destination establishments such as Florent and Hogs & Heifers. However, New York City Landmarks Preservation Commission designated the Meatpacking District (a.k.a. 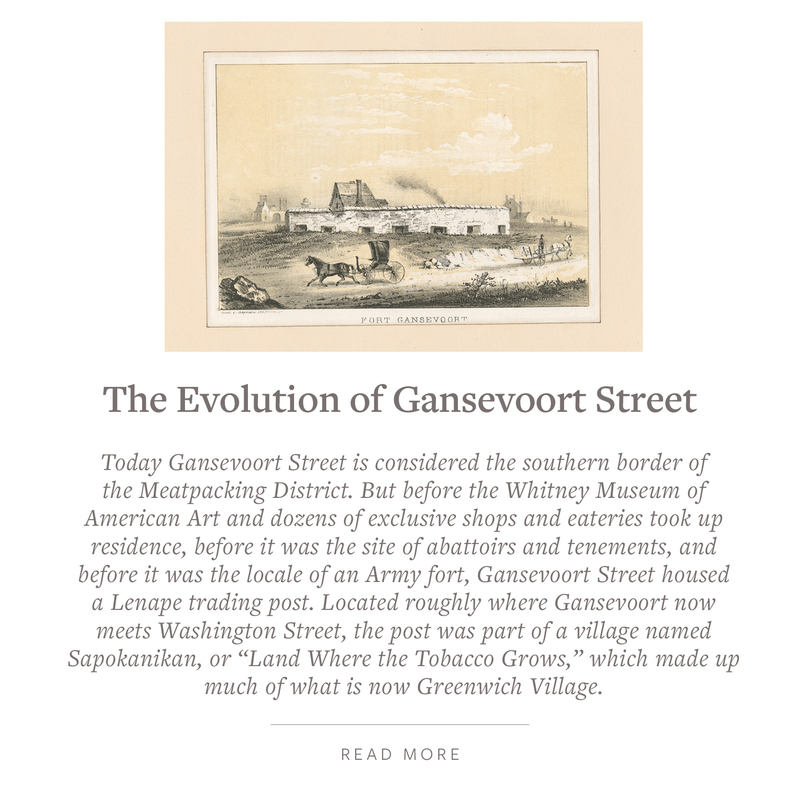 Gansevoort Market area) as an historic district in 2003, and continues to preserve the past while embracing the future. The Meatpacking District began it’s transition away from its past in the mid-90’s with arrival of the Chelsea Piers Sports Complex (Opened 1995), Chelsea Market (Opened 1997) – 75 Ninth Avenue once home to the Old Nabisco Factory and now a food hall, shopping mall, office building and television production facility. Jeffrey, the luxury retail store, opened its’ doors in the summer of 1999 and out of necessity moved into the “MeatPacking District when that ’hood was basically still a piece of steak.” Jeffrey Kalinsky, its founder, leased 12,000 square feet for 20 years and in retrospect appears to have had the foresight of what the Meatpacking District was to become. Then, trendy neighborhood hotels popped-up – Soho House, Maritime (Opened June 2003), Gansevoort (Opened 2004), The Standard (Opened 2009), Dream Downtown (Summer 2011). During this period, Apple Store (Opened 2007), Manhattan’s only Apple Store with a three-story glass staircase, and an entire floor dedicated to service and first to offer free pro-classes. As well as internet tech giant Google, swooped in at the time of the infamous “Tech Bubble” and purchased 111 Eighth Avenue, art deco building designed by Lusby Simpson and completed in 1932, just one year after the Empire State Building and the Chrysler Building for $1.9 billion and WeWorks co-working space to over 150 companies at 1 Little West 12th and Sephora 4,000 square foot experiential store at 25 Ninth Avenue below Catch Restaurant (Opened 2011). Catch Restaurant (EMC Group) took and gamble and bucked the trend of leasing retail space and rather choose to lease the second, and third floor and rooftop, nearly 3x larger than the retail space below at a fraction of the cost. Followed by cultural institutions: the Chelsea Highline (Opened in 2014), which now has its own APP to improve your experience and hosts many free programs to engage the community, and New Whitney Museum of American Art (Opened 2015) designed by Renzo Piano. Soon to follow the buzz was Samsung’s interactive experience store at 837 Washington (Opened early 2016), marking the first-of-its-kind cultural destination, digital playground and marketing center of excellence. The Gansevoort Market named after the Revolutionary War figure Peter Gansevoort with a mix of purveyors was relocated to 353 West 14th Street, and more recently, Tesla Electric Car Showroom (Late 2017) for the first time, sells cars, solar panels and batteries permanently under one roof. Alibaba, China’s Amazon took 30,000 square feet, and SoFi, financial tech firm, online Lender leased 13,000 square feet for 10 years at 860 Washington Street. “The Meatpacking District has become a notable exception in Manhattan’s retail scene. 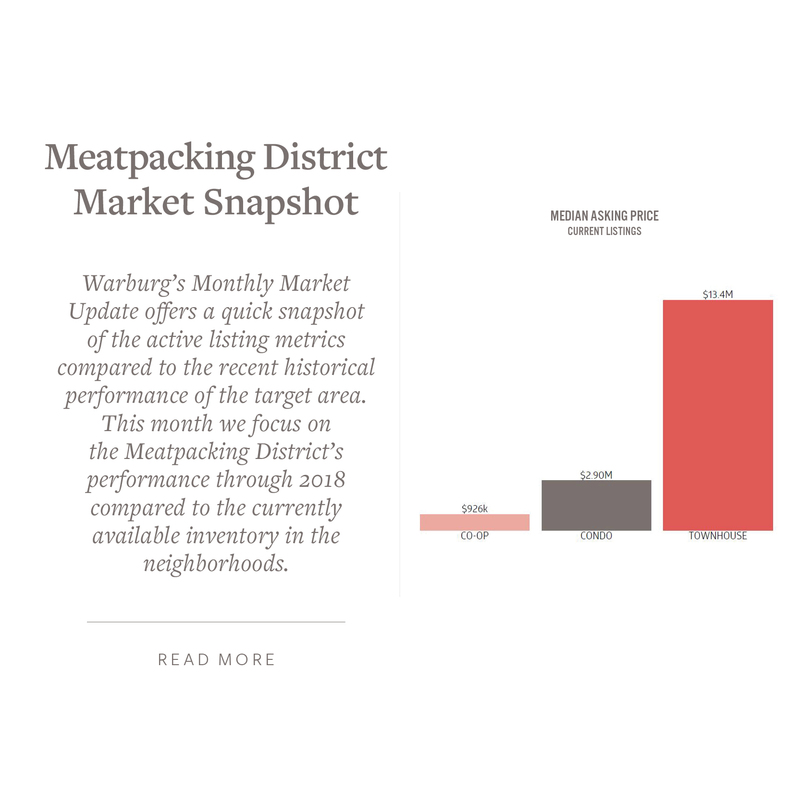 The neighborhood was the only submarket in the borough to buck the retail slump in the beginning of the year, according to a recent report from Cushman & Wakefield. Asking rents in every other shopping corridor in the city fell, they but rose five percent year-over-year in the Meatpacking District to an average $371 per foot. The Meatpacking District like a caterpillar is molting its skin yet again to unveil its new diverse and creative identity. There are currently many active projects underway in the district encompassing both new construction and expansion of existing properties. These new additions add approximately 900,000 new commercial square feet to the district. Additionally, a newly redesigned and cobbled landmarked specification Gansevoort Plaza (21st Century Plaza) between Hudson and Ninth Avenue is underway to facilitate public gatherings, engagement, events, and build the community. The plaza’s new face lift will provide the restoration of the belgian blocks, replicas of historic Bishop light poles commercial planters evoking box trucks a nod towards its manufacturing and industrial origins, public seating, a larger pedestrian walk-ways and bike lanes. In partnership with Google there is free WIFI is available district wide: #MeatpackingNY. Google expanding its footprint in the district with the purchase of Chelsea Market for $2.8 billion. World Largest Starbucks (knicknamed: “Willy Wonka of Coffee”) 20,000-square-foot new home within a nine story office building at 61 Ninth Avenue designed by Rafael Vinoly. The roastery will be an interactive theatrical experience on two levels celebrating coffee and craft. A food market is anticipated to take over the old Jean-George Vongerichten restaurant Spice Market in a two-story space at 403 E. 13 St., on Ninth Avenue. Restoration Hardware Flag Ship Store (Anticipated Opening 2019) experiential retail center– 9-19 Ninth Avenue (a.k.a. 7 Little West 12th Street) and will feature 90,000 sq. ft. of indoor and outdoor space, with a transparent elevator that goes up to a glass-encased rooftop restaurant with retractable doors that open out to a landscaped park. Restoration Hardware (RH Guesthouse) on 55 Gansevoort Street a 14 Room Hotel. The desing for the building’s renovation comes from architect Caroline Otto of TriBeCa based Anderson Architects, who worked with preservation consultant Jacqueline Peu-Duvalion. Hermès – 46-48 Gansevoort between Ninth and Washington leasing 10,000 square feet for 10 years (Anticipated Opening Spring 2019) will have a cool vibe with a small cafe and rooftop terrace in aims of targeting younger customers. Pastis Restaurant is returning to the area at 52 Gansevoort St. James Beard restauranteur Stephen Starr will be running the restaurant when it opens (Anticipated Opening 2019). Live Nation, concert promoter enlargered its office footprint in the area inking a 20,756-square-foot lease at Rockpoint Group and Highgate’s 412 West 15th Street, next door to its current office at 430 West 15th Street occupying the entire 100,000 square-foot building and continuing to expand its footprint in the neighborhood. Gansevoort Market Block: 46-74 Gansevoort Street expected to feature roughly 100,000 square feet of retail space. 437 West 13th glass tower Romanoff Equities hired GKV to design a new commercial building on the corner of West 13th St and Washington St. The existing 2-story meatpacking warehouse was demolished to make way for the new building. Pier 57 built in 1952 and is considered significant because of its innovative engineering design by Emil Praeger, who also designed floating piers for Allied landings in World War II is being transformed into a mixed use development with a food marketplace, office uses and new public open space. The Meatpacking District is the “test kitchen” for innovation. The amalgamation of many different workforce sectors: Technology | Fashion & Design | Food & Hospitality and Arts & Culture generates an inspirational and experiential vibe. Whether a visitor or a local resident the Meatpacking District is continually creating new sensory experiences that challenge perceptions, enable exploration and create wonderment. It’s prime location on the waterfront is the canvas that the old and new architecture is juxtaposed upon. The good weather is still here and perfect for exploring the many New York Neighborhoods. Don’t delay taking advantage of the many sites and activities that abound – Only 60 days remain of summer. This Friday, July 27th welcomes the Thunder Moon, the longest total lunar eclipse of the 21st century. The total phase of the “blood moon” eclipse of July 27th will last 1 hour and 43 minutes, during which the Earth’s natural satellite will turn a spectacular red or ruddy-brown color. From start to finish, the entire celestial event will last nearly 4 hours. The eclipse won’t be visible to viewers in North America, except via webcasts. But observers in much of Africa, the Middle East, southern Asia and the Indian Ocean region will have a spectacular viewing. This summer head west and venture to the Meatpacking hot spots. Cool off with a libation at one of the trendy hang-out: Brass Monkey – 55 Little West 12th, The Tippler – 425 West 15th, Troy – 675 Hudson, Woodstock – 446 West 14th Street, The Standard Biergarten – 848 Washington, Common Ground Bar – 63 Gansevoort. Or, have a meal at 1868 Old Homestead Restaurant, a reflection of the areas bovine roots. Let me know if I can be of service to someone from your network who would enjoy a Sunday Open House list for an area they are exploring or would like a neighborhood Market Report. It’s always a pleasure to hear from you so give me a call and let me know what’s on your mind.